The Slovak National Theater will present two plays as part of its long-term cooperation with the Prague National Theater. The first is a salon comedy by director Peter Mikulík, The Ideal Husband, about the conversion of a scrupulous politician whose life is invaded by intrigues and blackmail. The second play is a dramatization of the Slovak tragicomic novel Great Happiness, directed by Lubomír Vajdička. It depicts the story of three different young women who gradually discover that their feelings of love for the same man probably won’t work out. One of the most beloved classical ballets, Swan Lake was originally a German fairy tale about the princess Odetta, changed into a swan, the warlock Redbeard, and the unhappy Prince who forgets his oath. It was immortalized thanks to the music of Peter Ilyich Tchaikovsky and the original, preserved choreography of Lev Ivanov and Marius Petipa. The National Theater presents the work as a romantic ballet with elaborate sets and overwhelming performances by its leading soloists. The twin role of Odetta Odilia is played alternately by Tereza Podařilová, Zuzana Susová, Keiko Sakamoto, and Nikola Márová. The Prince is played by Alexander Katsapov, Michal Štípa, and Filip Barankiewicz. One of Giuseppe Verdi’s most popular and vital works isn’t an opera, it’s the Messa da Requiem, and it was first performed in1874 in Milan. 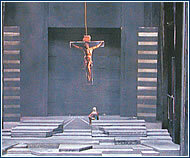 As a part of the “Italian Line” cycle, the National Theater is giving this work an atypical presentation as a dramatization. It is performed by the National Theater Orchestra and the Prague Philharmonic Ensemble, conducted by Jiří Kout. The vocalists are Catarina Cellia Costea (soprano), Yvona Škvárová (alto), Valentin Prolat (tenor), and Miloslav Podskalský (bass). The play is directed by Jiří Nekvasil, with sets by Daniel Dvořák. An internationally travelling exhibition called “Magic Hands” is the result of the Lifetime Achievement Award given to the news photographer Elliott Erwitt. The collection contains 97 black-and-white photographs, mostly action shots. “Small Retrospective” presents a selection of photos by Erwitt taken between 1953 and 2001. 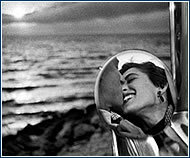 Born in Paris in 1928, Erwitt emigrated at age 11 to the US with his Russian parents. To date he has arranged numerous photograph essays, illustrations, and commercial work. He became famous for his distinctive photographic study of dogs and their masters, and his portrayal many famous personalities, “Snaps”, is also well known. Tickets for these events may be purchased at any of the Ticketpro outlets, online through www.ticketpro.cz., or by phoning the TicketPro call center at 296 329 999.